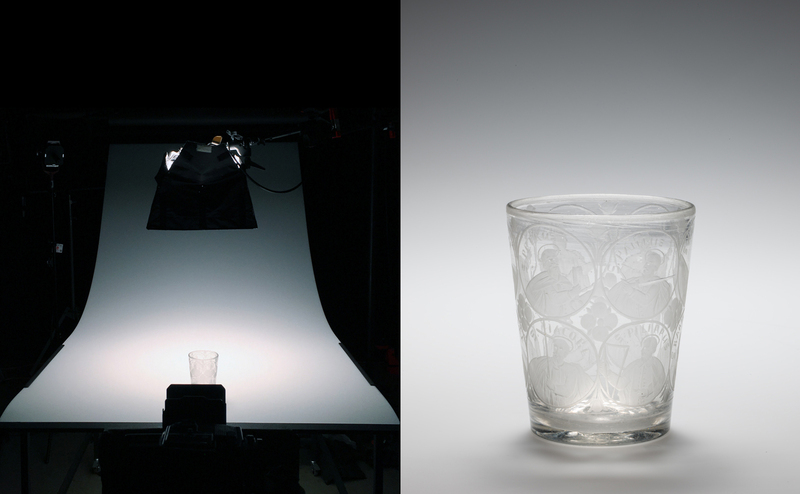 This is the second in a series of blog posts addressing photographic lighting techniques for transparent glasses. It builds on the techniques discussed in the first post, Photographing glass: Lighting techniques for transparent glass objects. Goblet, The Netherlands, 1760-1770. Gift of The Ruth Bryan Strauss Memorial Foundation. 79.3.993. 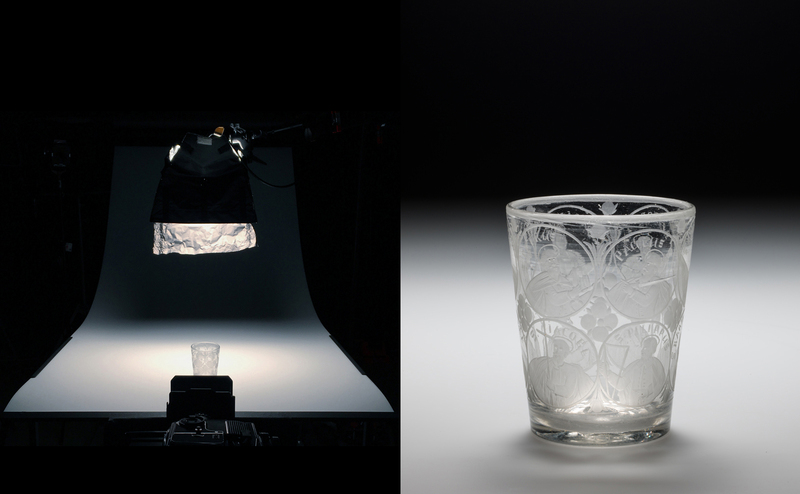 In the first post, I used an 18th century engraved wineglass from The Netherlands (CMoG 79.3.993, shown above), to demonstrate how we can reveal detail by exploiting the ways glass interacts optically with its surroundings in a carefully controlled lighting environment. This object was photographed on a photo table with a matte finish translucent white acrylic surface (Plexiglas 2447 with a P95 finish) using a combination of lighting both above and below the table surface. In this second post, I will demonstrate how the lighting principles previously described can be employed without using any lighting below the table. The same acrylic surface table is used here, but these techniques work with any smooth opaque neutral table surface or paper background. 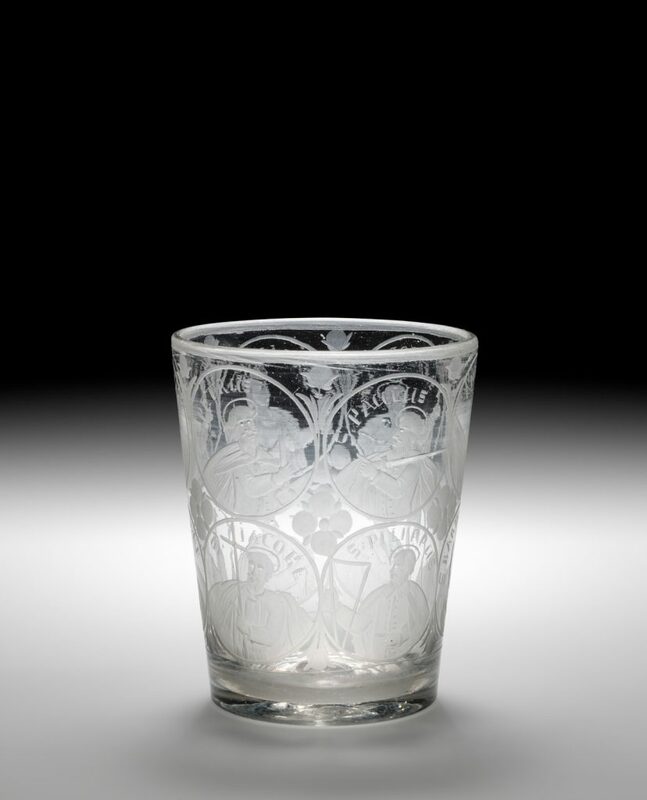 The case study object is an 18th century engraved beaker from Germany (CMoG 60.3.47). Two rows of engraved portrait medallions fully encircle the beaker and present a particularly difficult challenge: no matter the angle of view, the medallions on the opposite side interfere with the visual readability of the medallions on the front. In a case like this, control of lighting contrast is especially critical. To begin, I positioned one broad soft light above and slightly behind the beaker on the table with one broad overhead soft light. There is just enough moderate contrast in the lighting that the portrait medallions are visible, but they are not particularly legible. Next, I attached a black aluminum foil flag to the back of the soft light to create a higher contrast falloff from light to dark. Note how the upper row medallions have become much more readable as light engraving against dark and the lower row has become more readable as dark against light. However, there is still a lot of visual confusion. Finally, I focused a concentrated beam of light from a Fresnel spotlight on the surface of the table just behind the beaker, and I replaced the black foil flag with a larger one with a strip of roughly ripped spun diffusion material attached to the bottom edge. This new flag lowers the light falloff even more, and the diffusion softens the transition. 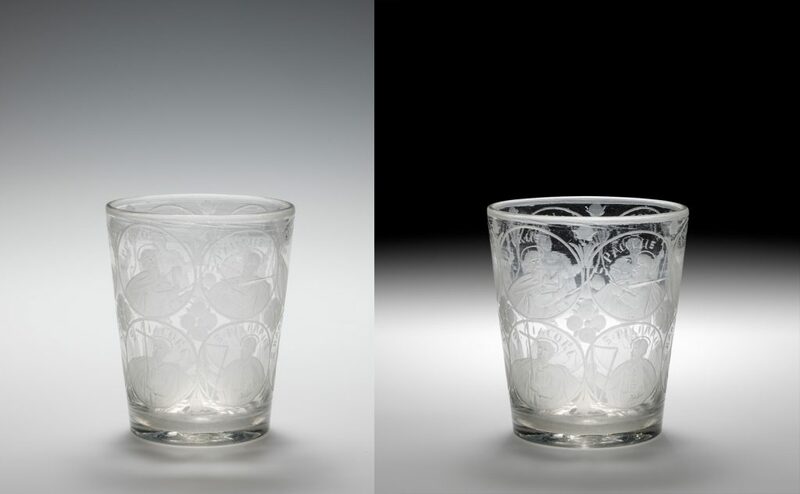 The resulting increase in contrast between light and shadow directly behind the beaker dramatically improves the readability of the engraving in both rows of medallions. 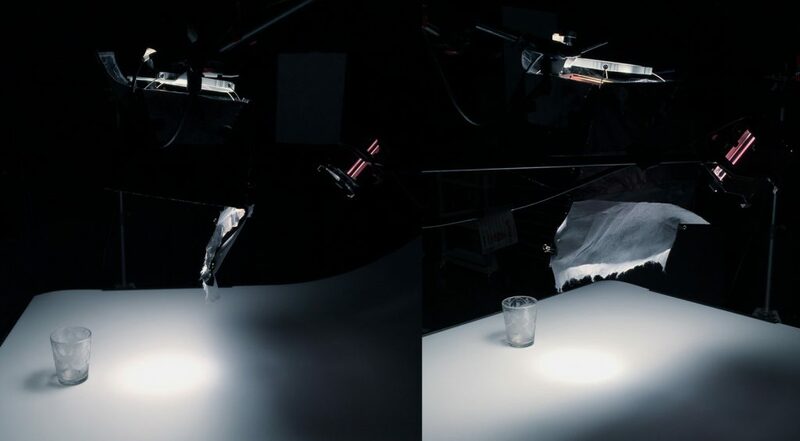 These angles show the relationship of the soft light, the foil flag, and the spotlight beam behind the beaker. For comparison, here is where we started on the left, compared to the final image on the right. The difference in lighting was achieved with only the addition of a flag and a carefully placed spot of light. 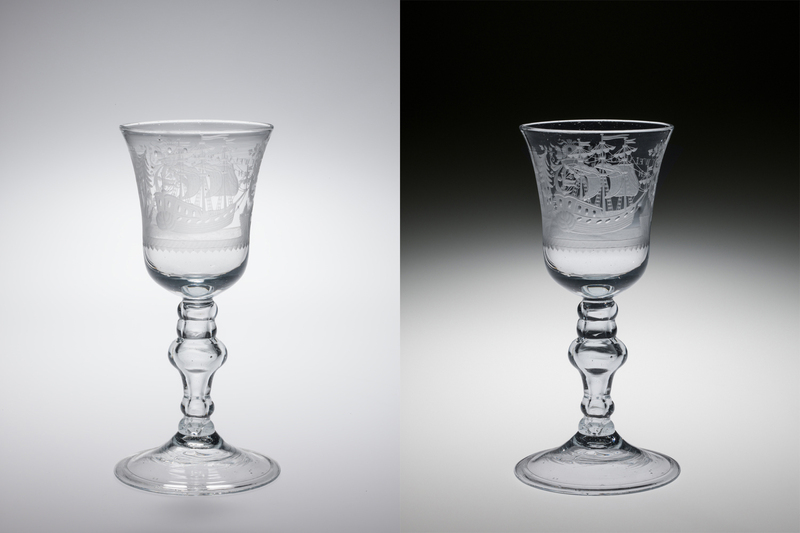 The appearance of the glass, however, is dramatically altered—the glass has more clarity, the engraving appears more crisp, and the inscriptions are more legible. Beaker, Germany, 1701-1800. Gift of Mrs. John Foster Dulles. 60.3.47. Just as with the first post in this series, this example demonstrates that it is impossible to separate our perception of transparent glass from our perception of what we see through the glass. In fact, our perception of transparent glass is a result of how it transmits, refracts, reflects, and distorts light. To capture detail in glass photographically, we must exploit these properties by carefully controlling the lighting environment. In the next post, I will demonstrate how the same approach can be used to capture subtle elements like tooling marks, optic ribbing, bubbles, and air-traps. 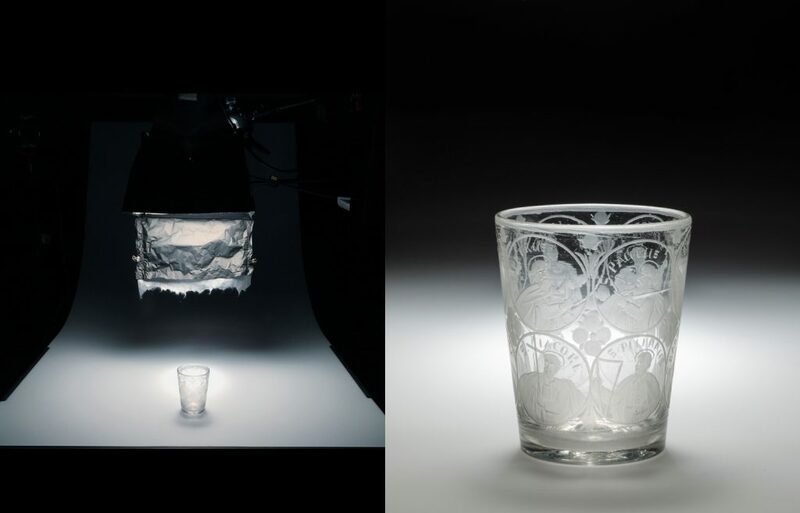 Andrew Fortune is the Collections Photography Department Manager at The Corning Museum of Glass. Excellent and very informative, just like part 1.